One week has finally came to its end, and I’m already back where I used to be; tending the weeds of this blog, so that it’s maintained properly and grows in the direction that I want it to. While watching MTV, I discovered a couple of new and not-so-new things (and if things are in need of straightening up, I am directly referring to MTV Asia of course, what else?). The first one being a new show called ‘MTV Reverb’, introduced especially to promote what they seem to call, ‘REAL MUSIC’. Here’s a hint, artists such as Klaxons, LCD Soundsystem and Rooney will be featured; it makes me wonder - if those are real music, then what kind of music have they been playing all this while? The second one being about Perez Hilton announcing his plans on holding a boycott against Britney Spears while telling people to instead support for Feist. But with Britney’s new song receiving rave reviews from all fans alike, yeah right, dream on. Don’t boycott Britney; everyone knows she’s a huge screw-up, but people love her still in spite of it all, if not because of it. Just do what I do, act oblivious. 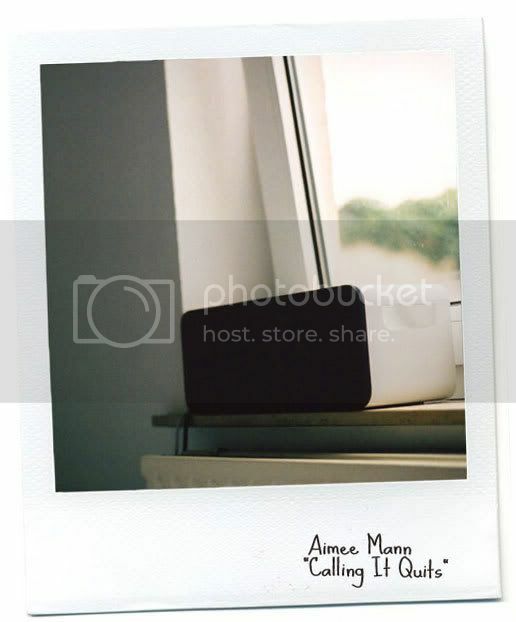 Aimee Mann is just one of the many artists from the US whose music stays mainly in the US, unless a certain country requires otherwise. Her name is rarely heard around these shores, let alone her music; shows how one really needs to put an effort to discover music, and not just sit around waiting for the number one song on the charts to finally come out. The way I discovered her was through a book; Nick Hornby’s ’31 Songs’ to be more precise. It’s only natural that I had the urge to listen to her myself after reading the way Hornby wrote highly of her. In a way things would turn out, my sister got to her one of her songs first which was then soon after passed over to me. ‘Calling It Quits’ is dramatic music with dramatic lyrics, He's a serious Mister/shake his hand and he'll twist your arm, lyrics that are simple, direct and yet overflows with plain emotions. Her songs are indeed melodies for a darker mood due to its bleakness and dejection vibe that stays intact. Why I find this tune magnificent is because of its isolated and empty feel that greatly expresses misery and despair, a thing we can all relate to once in a while. The song is exquisite because of that.